Ireland No 8 Jamie Heaslip is the current captain of the national side and played a key role in Leinster's recent back-to-back Heineken Cup triumphs. He was born in Tiberias, Israel in 1983 while his father, Brigadier General Richard Heaslip, served there with the United Nations Interim Force in Lebanon, whose job it was to ensure that Israel withdrew from Lebanon. 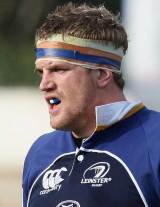 Heaslip's provincial debut came in March 2005 and he has since become a fixture of the side. His full Ireland debut came in 2006 against the Pacific Islands, and Heaslip also has the distinction of being the 1000th man to represent Ireland. Heaslip missed out on the Ireland squad for the 2007 World Cup, but following Ireland's disappointing showing in France he was able to make the No.8 position his own. He started all but one of Ireland's 2008 Six Nations matches before winning further caps on tour against New Zealand and Australia that summer. He retained his place in the squad under new coach Declan Kidney and during the 2009 Six Nations Heaslip came into his own, scoring a stunning try against France in the opener and also the winning try against Scotland at Murrayfield. His efforts helped Ireland to their first Grand Slam for 61 years, and he added a remarkable domestic double when he started as Leinster won the Heineken Cup at Murrayfield. Heaslip's form also won him selection for the 2009 British & Irish Lions' tour of South Africa. He started all three Tests and produced a stellar performance in the third Test victory in Johannesburg as the Lions narrowly lost the series 2-1. His form continued to impress during the 2010 season and he was instrumental in Leinster's march to the Heineken Cup semi-final where he scored his side's only try in the 26-16 defeat to eventual winners Toulouse. Heaslip then turned from hero to villain during Ireland's Test against New Zealand in New Plymouth, receiving a five-week ban for kneeing All Blacks captain Richie McCaw in the head during a ruck only 15 minutes into the match. Heaslip's red card was instrumental in his side's 66-28 defeat. However, he was back in the Irish squad for the 2011 Six Nations and went to the World Cup as part of Ireland's 30-man squad for the tournament. Once again Heaslip was a central figure in Ireland's campaign. However his form began to slide during the 2012 Six Nations and his place in Ireland's back-row came under pressure. But Kidney kept the faith with his man and the No.8 was a shining light in Leinster's charge to both 2011 and 2012 Heineken Cup glory. With Brian O'Driscoll sidelined, Heaslip wore the captain's armband for the 2012 autumn Test series and kept that honour for the 2013 Six Nations. Ultimately Ireland endured a disappointing campaign after a positive start against Wales. Heaslip came in for some heavy criticism but his form was sufficient to earn a call up to the British & Irish Lions squad to tour Australia.